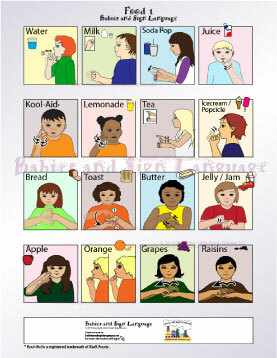 Find out what your baby or toddler likes to eat using this custom illustrated, detailed chart from Babies and Sign Language! Each panel shows an illustrated child signing a useful ASL sign. Each sign is shown using anatomically correct hands. This poster is available in either full-color or black-and-white. It is immediately delivered in PDF format, digitally, so you don't have to wait for shipping.